OMPOSING THESE SETTINGS has been a great blessing, helping me enter into prayer. I hope it will be of some help for you too. To sing these texts is to journey from Christ’s Resurrection to the descent of the Holy Spirit. Although intellectually understood, it is still an emotional experience to realize HOW MANY ALLELUIAS are in all of the Easter propers! After abstaining from “Alleluias” throughout Lent, it is a blessed relief to sing “Alleluia” over and over again within these beautiful texts from scripture. •	Includes ten settings from the Easter Vigil though Pentecost Sunday. Also included is a setting for the Seventh Sunday of Easter in those dioceses in which The Ascension of Our Lord is not transferred to Sunday. •	All are chant based. 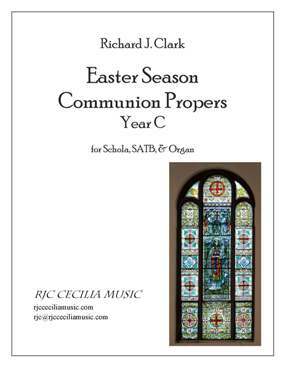 •	Can be sung with cantor or schola with organ. There is enormous opportunity for optional SATB singing, designed to offer contrast with unison singing. These ten antiphons were composed within a twenty-four hour period, so hopefully there is some continuity among them. The antiphons should always be sung with forward, yet unhurried movement, and often with an air of lightness—not always in color but in spirit and energy. Even the intensity of the Pentecost antiphon should be sung with light forward motion, yet still unhurried (despite the “rush of a mighty wind”!). Each antiphon colors the text simply and occasionally with symbolic gesture. For example, the Easter Vigil / Easter Sunday antiphon ends a half step below the tonic — unresolved and evoking the mystery of the empty tomb. The Pentecost antiphon uses a similar device, bookending this collection. Another example is found in the Sixth Sunday of Easter which utilizes an augmented fifth chord—three equal intervals representing the Trinity — the augmented fifth, symbolizing the Holy Spirit. Furthermore, on Ascension Thursday, the final chords in both the antiphon and verses are unsupported by the root, but instead by the third providing a sense of elevated motion.